Authenticity in business, it's a term that gets whipped around like a weapon in some places. Not with Mana Ionescu of Light Span Digital though. I loved her blog post about the topic. Authenticity is not just about being sincere, real, and honest. It’s about being reliable, dependable, being true to what you say you will do, acting the way you say you will. I am attracted to people who have a casual, yet excellent, approach to business. I'm not pulled in by people who present a ‘too polished' front. My reactions are all about me of course, but I make up that someone who has to be ‘just right' with every single thing is going to be fussy to work with or hard to get along with. It may not be true – but my experience in 16+ years has confirmed that people who are more casual online are often really fun to get to know and work with. So I just want to say, if you're trying to present yourself perfectly and act a certain way – think about Mana's advice to be the authentic you. You may just start attracting more of what you want! This is a great one! 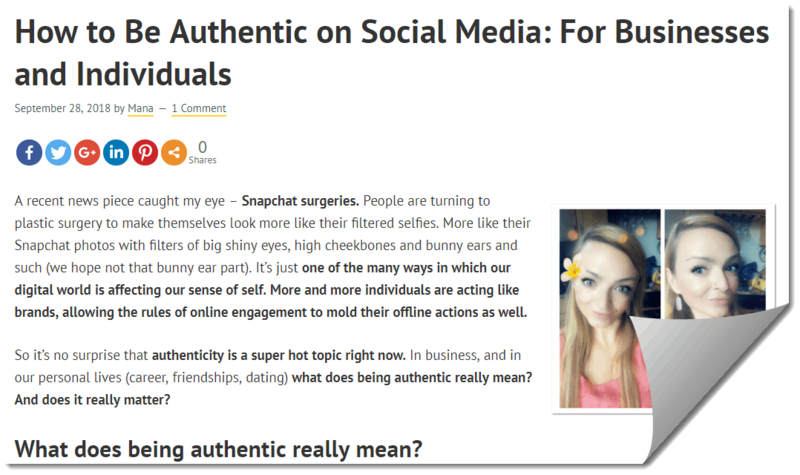 I think people are really craving authenticity. I want to hear from someone who knows what they are talking about not because they are perfect but because the failed and succeeded.